​The House of Mica Peace Chamber is dedicated to promoting personal healing and world peace through prayer, chanting, sacred dance and ceremony. The House of Mica Peace Chamber, completed in 1999, is a physical building, partly underground and partly above ground, built in the style of a kiva. We are one of about 40 such peace chambers around the world. We have been recognized as a 501 (c) 3 not for profit educational organization since 1998. The original vision of the peace chambers was given to the Native American Shaman Beautiful Painted Arrow in 1983. The caretakers of the House of Mica Peace Chamber are Rick and Elisa Cotroneo, long time students and dancers with Beautiful Painted Arrow. The House of Mica Peace Chamber is non-denominational and does not espouse any particular religious beliefs. 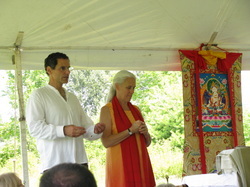 Our purpose is to provide sacred ceremonies in which people can be inspired to find their own path of healing in the world. For more information call 518-729-2429.